When a dead whale was discovered on a beach in the Philippines on Saturday, government veterinarians mistook it for a pregnant female because of its swollen belly. 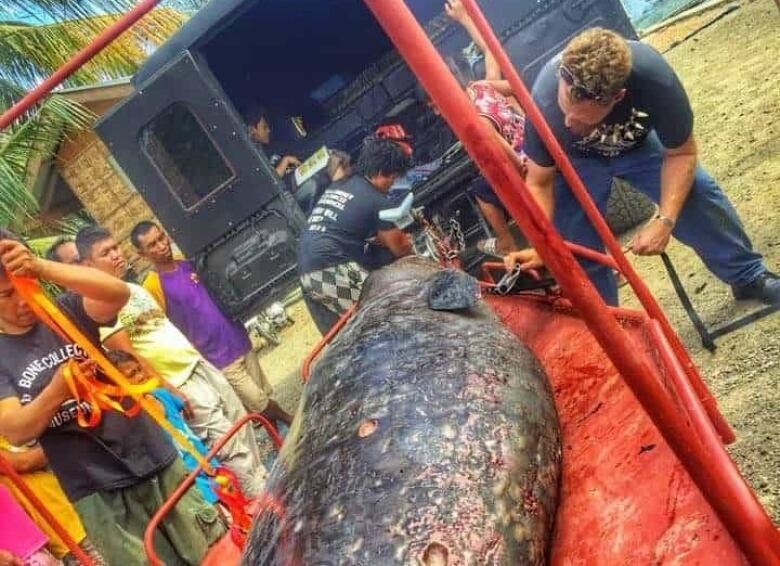 In fact, it was a severely emaciated juvenile male Cuvier's beaked whale, filled to the brim with 40 kilograms of hard, calcified plastic garbage. The whale was found on the beach near the town of Mabini. "As we started to cut it open, I put my hand down inside the stomach, immediately hitting hard debris," Darrell Blatchley, owner of the D'Bone Collector Museum in Davao City, told As It Happens guest host Helen Mann. "It was obvious that it wasn't its normal food, because this animal should be eating squids and fishes." Blatchley, who helped with the necropsy conducted by the country's Bureau of Fisheries and Aquatic Resources, says it's the biggest collection of plastic he's seen inside an animal, all calcified into a rock-hard lump the size of two basketballs. "As we started to pull it out, the first one was a grocery bag — and then it was literally just bag after bag after bag," he said. "It was unbelievable how much plastic was in there." Since the 1950s, human beings have produced 8.3 billion tonnes of plastic — and 6.3 billion tonnes of that has already become waste, according to a 2017 study from the University of California, Santa Barbara. 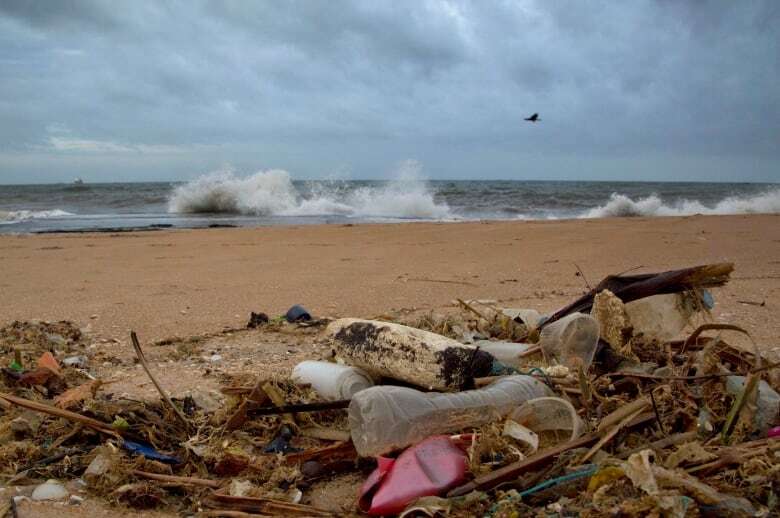 In 2015, the same researchers found that somewhere between 4.8 million and 12.7 million tonnes of plastic from people living within 50 kilometres of coastlines had already made its way into our oceans. Much of it is centred in the Great Pacific Garbage Patch, a floating mass of mostly plastic that's grown three times the size of France. But ocean plastic has also been found in areas as remote as Antarctica and as far down as the planet's deepest ocean trench. And it's getting into the bellies of marine life, causing slow, often agonizing deaths. "This animal has been suffering for months, if not even possibly a year, to get to that point of the plastic being compacted," Blatchley said. "And with the stomach acids trying to digest the plastic, it's producing more and more stomach acids, which are also then eating the lining of the stomach. 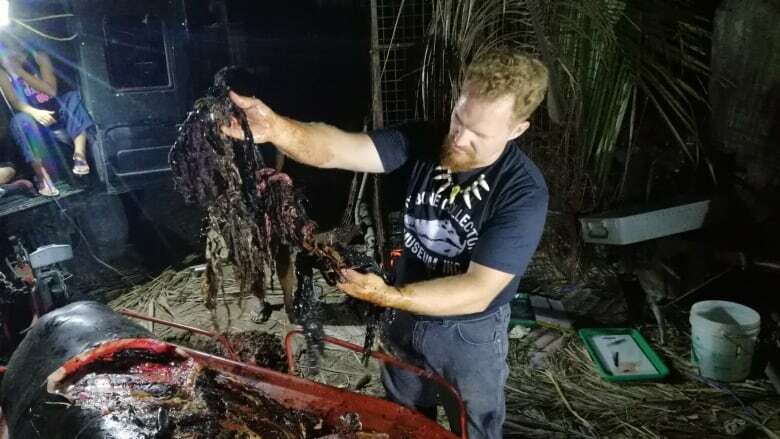 So the normal things like the squid beaks and stuff were actually starting to puncture the stomach lining, which towards the end, right before it died, it was actually vomiting up blood." When the whale first swallowed plastic, Blatchley said, it would have become hungry and dehydrated, and too weak to dive deeper in search of food. As it skimmed the surface in search of natural prey, it would instead gobble up even more plastic, perpetuating the vicious cycle. "It's going, 'I'm still hungry, I'm still thirsty, I'm getting weaker, I've got to catch more prey' — and the plastic is more abundant than the food," Blatchley said. Eventually, he said, the creature starved to death with a full belly. Dehydration and starvation are listed as the official causes of death. "I don't want to sound cheesy, but it breaks my heart," Blatchley said. "I have two sons, an eight-year old and a nine-year-old, that when they see people throwing garbage on the ground, they get mad because they know it's going to cause the death of an animal if it reaches the ocean." More than half the plastic waste in the oceans comes from five countries — China, Indonesia, the Philippines, Thailand, and Vietnam — according to 2017 report by Ocean Conservancy. And if there isn't a culture shift, Blatchl﻿ey says, things will get worse. "With the Philippines, it has to go from a mentality of, 'It's not my problem' to 'It's everybody's problem,'" he said. "It's going to get worse. It's going to get to the point where this becomes the normal, and it's abnormal to find them dying of natural causes." Written by Sheena Goodyear. Interview with Darrell Blatchley produced by Chris Harbord.